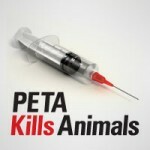 People for the Ethical Treatment of Animals (PETA) — last seen killing nearly 90 percent of the dogs and cats in its care last year — likes to trot out celebrities who have supposedly given up meat, dairy, and eggs and “gone veg” to make the inaccurate claim that all the “cool kids” are PETA types. But one of PETA’s latest attempts to prove the impossible has put soy-egg substitute on the notorious organization’s face: PETA named Dax Shepard its “Sexiest Vegetarian Celebrity,” but he’s a meat-eater. Like one-time vegan NFL footballer Arian Foster, he confessed to eating poultry. We’d like to welcome Shepard back into the 98 percent of us who aren’t vegan, though ultimately what he eats is his business, not ours or PETA’s. Mischaracterizing Shepard’s dinner menu isn’t PETA’s worst error — that dishonor must go to either PETA’s aforementioned pet shelter of horrors, its giving a sizable grant to an arsonist, or the group’s shameless propagandizing of children — but it does suggest an interesting question: With all the chattering classes’ talk of people “going veg,” do people actually stick to a vegan or vegetarian diet? We recently tasked Opinion Research Corporation (CNN’s pollster) to find out. The company surveyed a nationally representative sample of 1,000 Americans to determine how many tried and failed to follow the PETA diet. Only six percent bothered to try veganism. An additional 18 percent gave up meat while holding onto dairy and eggs. So, are these folks all still faithful to the PETA ethic? The sizable majority isn’t. Our findings discovered that 82 percent of those who tried to give up meat (both vegetarians and vegans) eventually gave in to its flavorful temptations. Perhaps bacon, the “gateway meat,” played a role. Ultimately, puff pieces purporting to prove that pork, poultry, and porterhouse are leaving the American table lack support. While PETA, its animal liberationist comrades at Humane Society of the United States, and foodies like the New York Times’ Mark Bittman proclaim the vegan hour is nigh, in reality their message isn’t breaking through.